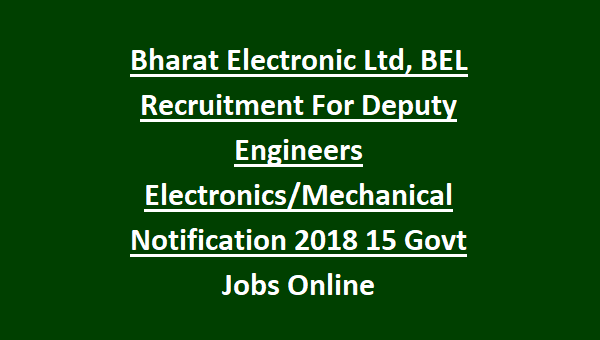 The BEL Company has 240 vacancies for Deputy engineer in electronics/mechanical. Upper age limit is 26 years as on 01-09-2018. The students who are completed btech in electronic/mechanical can apply for these posts. 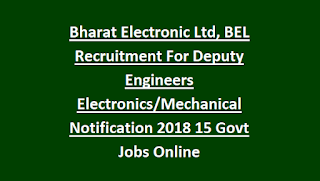 The students who are interested to apply for Deputy engineers in BEL company should have passed in B.E/B.Tech(Electronics, Mechanical, Electrical, Instrumentation & Information Technology Engineering). The Pay scale to Deputy engineers(electronics/mechanical)-Rs.40000-140500 PM. The candidates are selected by interview or written exam. The candidates who are attaining the interview must bring their original certificates. The candidates should apply on online mode. The online applications are opened from 12-09-2018.